Spot silver prices continued their upwards momentum yesterday ending in a positive mood once again having broken above the $16 per ounce level once again, closing the silver trading session with a wide spread up bar and small shadow to the upside. Technically the key level at $16.50 is now coming into play and may well dictate the future for silver prices in the short term as this is the lower level of a deep area of consolidation spread over a $2 per ounce price band. If gold prices and silver prices continue to correlate positively, as they seem to be at present, and the strong surge continues for spot gold, then we should see an equivalent rise in silver prices which should drive them through this technical resistance area. However, this band is both wide and deep and will therefore require considerable momentum to penetrate and breach this area. If this can be accomplished in the medium term then this will open the way for a sustained move on the $20.50 per ounce region last seen back in early 2008. 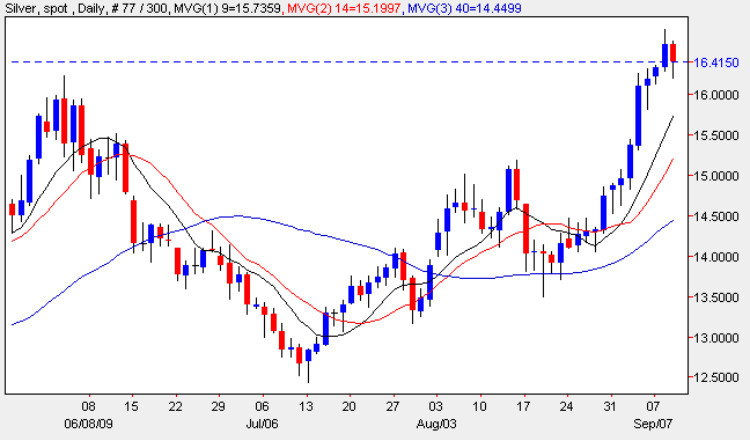 With all three moving averages pointing higher and with the 9 week moving average having crossed the 14 week moving average on the weekly chart this is generally adding to the bullish sentiment for spot silver prices at present. My trading suggestion for today is to look for small long positions buying on any short term intraday reversals with a view to building positions into a longer term trading scenario.